In this second volume of The “Unknown” Reality, Seth radically expands our conceptions of “self” by showing us that the human personality is literally infinite in its scope and potential. He discloses precisely how probable realities combine to create our waking lives, and how our “higher selves” make decisions regarding our everyday existence. In Volume One of The “Unknown” Reality, Seth initiates a journey in which it seems that the familiar is left behind. Where do the events of our lives begin or end? Where do we fit into them, individually and as members of the species? These questions, with Seth’s explanations, are the heart of Volume One. 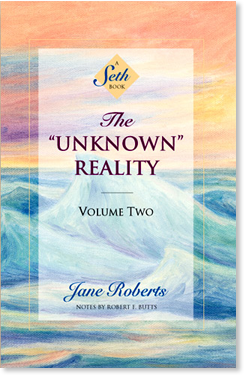 In Volume Two of The “Unknown” Reality, Seth invites us to join in and discover the unknown reality for ourselves through a series of exercises geared to illuminate the inner structures upon which our exterior ones depend. Volume One provides the general background and information upon which the exercises and methods in Volume Two are based. There is an “unknown” reality. I am part of it, and so are you. Some time ago I suddenly appeared within your space and time. Since then I have spoken to many people. This is my third book. There would be nothing strange to anyone in any of this if I had been born into your world in a body of my own, in usual terms. Instead I began to express myself by speaking through Jane Roberts. In all of this there has been a purpose, and part of that purpose lies in this present book. Each individual is a part of the unknown reality. Because of my position, however, I am obviously more a part of it than most. My psychological awareness bridges worlds of which you are consciously aware, and others that seem, at least, to escape your notice. The woman through whom I speak found herself in an unusual situation, for no theories — metaphysical, psychological, or otherwise — could adequately explain her experience. She was led to develop her own, therefore, and this book is an extension of certain ideas already mentioned in Adventures in Consciousness. To write that book, Jane Roberts drew on deep resources of energy. The unknown reality, however, is unknown enough to usual reaches of the most flexible consciousness, in your terms, that it can only be approached by a personality as couched in it as I am. Once expressed, however, it can be comprehended. One of my purposes then has been to make this unknown reality consciously known. Man thought once, historically speaking, that there was but one world. Now he knows differently, but he still clings to the idea of one god, one self, and one body through which to express it. There is one God, but within that God are many. There is one self, but within that self are many. There is one body, in one time, but the self has other bodies in other times. All “times” exist at once. Historically speaking, mankind chose a certain line of development. In it his consciousness specialized, focusing upon sharp particulars of experience. But inherent always, psychologically and biologically, there has been the possibility of a change in that pattern, an alteration that would effectively lift the race into another kind of weather. Such a development would, however, necessitate first of all a broadening of concepts about the self, and a greater understanding of human potential. Human consciousness is now at a stage where such a development is not only feasible, but necessary if the race is to achieve its greatest fulfillment. Jane Roberts’s experience to some extent hints at the multidimensional nature of the human psyche and gives clues as to the abilities that lie within each individual. These are part of your racial heritage. They give notice of psychic bridges connecting the known and “unknown” realities in which you dwell. While you have highly limited concepts about the nature of the self, you cannot begin to conceive of a multidimensional godhood, or a universal reality in which all consciousness is unique, inviolate and yet given to the formation of infinite gestalts of organization and meaning. In my other books I used many accepted ideas as a springboard to lead readers into other levels of understanding. Here, I wish to make it clear that this book will initiate a journey in which it may seem that the familiar is left far behind. Yet when I am finished, I hope you will discover that the known reality is even more precious, more “real,” because you will find it illuminated both within and without by the rich fabric of an “unknown” reality now seen emerging from the most intimate portions of daily life. Your concepts of personhood are now limiting you personally and en masse, and yet your religions, metaphysics, histories, and even your sciences are hinged upon your ideas of who and what you are. Your psychologies do not explain your own reality to you. They cannot contain your experience. Your religions do not explain your greater reality, and your sciences leave you [just] as ignorant about the nature of the universe in which you dwell. These institutions and disciplines are composed of individuals, each restrained by limiting ideas about their own private reality; and so it is with private reality that we will begin and always return, period. These ideas in this book are meant to expand the private reality of each reader. They may appear esoteric or complicated, yet they are not beyond the reach of any person who is determined to understand the nature of the unknown elements of the self, and its greater world. Section 4: Explorations. A Study of the Psyche As It Is Related to Private Life and the Experience of the Species. Probable Realities As a Course of Personal Experience. Personal Experience As It Is Related to “Past” and “Future” Civilizations of Man. Session 708: Consciousness, Code Systems, and Earthly Cycles. The Body’s Healing Abilities. Practice Element 10. Section 5: How to Journey into the “Unknown” Reality: Tiny Steps and Giant Steps. Glimpses and Direct Encounters. Section 6: Reincarnation and Counterparts: The “Past” Seen Through the Mosaics of Consciousness.